A week ago the anchor handling tug Jacson 4 sank in heavy weather off the coast of Escravos, Nigeria. Divers were able to recover 10 bodies from the wreck, however, the ship’s cook Okene Harrison remained missing. Two days after the vessel’s sinking, divers located Mr. Harrison alive and well in one of the ship’s compartments. Miraculously, Mr. Harrison had survived nearly 48 hours on the oxygen trapped within the compartment. Complicating his rescue, though, was the fact that his body had normalized to the pressures of the environment 90 feet beneath the surface and a return to the surface without equalizing the pressure would result in death from the bends. Donning a diving helmet, Mr. Harrison moved to the safety of a diving bell (similar to the one shown above) where it took a further two days underwater for him to decompress and return to the surface. As of May 31st, Mr. Harrison was recuperating and responding well to treatment after his providential recovery. Falls of Clyde is today the only surviving four masted iron-hulled sailing ship. Built in Scotland in 1878 when the clipper ship reigned supreme, the Falls of Clyde operated as a tramp merchantman between the US and locations in the British Empire. Falls of Clyde later was converted to use as an oil tanker and even served as a floating fuel depot in Alaska. Perhaps the most intriguing fact about the Falls of Clyde is her backdoor entry into US passenger and cargo service at the turn of the 20th century. The Passenger Vessel Services Act of 1886 prohibited foreign flagged/built ships from ferrying passengers between US ports. Today, the Jones Act (passed in 1920) maintains a similar prohibition. A US company purchased the Falls of Clyde in 1899 and registered the ship under the Republic of Hawaii’s flag. Thus, in 1900 when the US annexed Hawaii the Falls of Clyde, despite her foreign origins, was allowed to fly the US flag and operate between US ports. 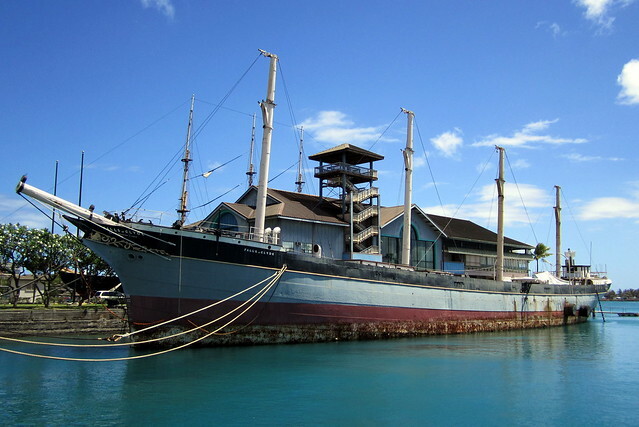 Falls of Clyde was restored in the late 1960s and served as a museum ship in Honolulu, Hawaii however the ship fell into disrepair after neglect by her parent museum. In 2008, the Friends of the Falls of Clyde purchased the ship and are working to restore her. Lake Tanganyika in southeastern Africa is the world’s longest freshwater lake and the second largest by volume. Plying the lake’s waters for nearly 100 years is the M/V Liemba. Originally built as the Graf von Gotzen in 1913 in Germany, the ship was intended to serve the colony of German East Africa. Upon the outbreak of World War I, though, the Graf von Gotzen was converted for use as a warship to help defend German East Africa. The commander of German forces in the region, Colonel Paul von Lettow-Vorbeck , waged such a brilliant and effective defense of the colony that his forces were still at large at the time of the 1918 Armistice. The Graf von Gotzen and her fellow gunboats so threatened Allied control of Lake Tanganyika that the Royal Navy dispatched two armed motorboats to defeat the German flotilla. Following a backbreaking journey through the jungles of Africa, the Royal Navy motorboats regained control of the lake and forced the Germans to scuttle the Graf von Gotzen in July 1916. Graf von Gotzen’s wartime experience served as the inspiration for C.S. Forester’s German gunboat Luisa in The African Queen. 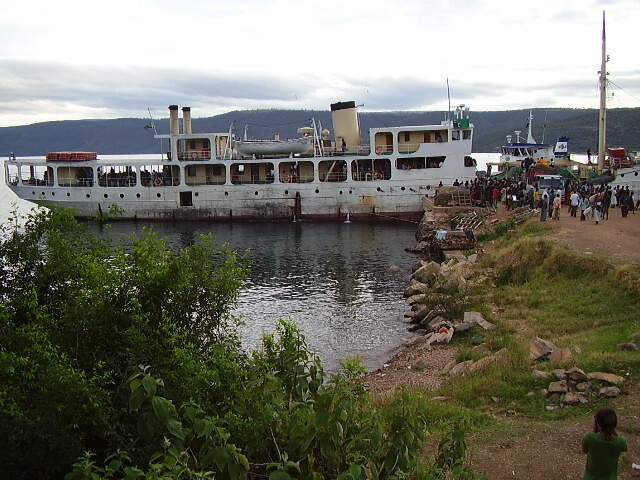 In 1924, a British salvage team raised the Graf von Gotzen and, after substantial refitting, recommissioned her as the M/V Liemba, the Swahili name for Lake Tanganyika. The Liemba has been in constant use ever since and has subsequently become seriously run-down. Debates over whether to overhaul or scrap Liemba have raged for several years. The most recent plan is for an overhaul costing 20 million Euros to occur and for the ship to revert to museum ship duty after her retirement. 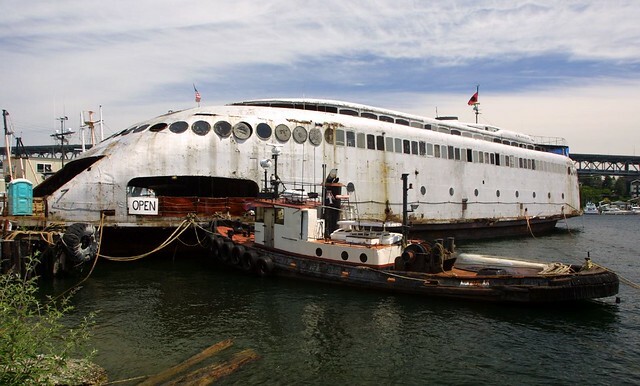 Once a majestic art deco ship shuttling passengers across Puget Sound, the Kalakala is today rusting away at her moorings in Tacoma, Washington. For nearly a decade, owner Steve Rodrigues has attempted to restore the ship to her former glory, but has faced serious funding issues and legal troubles with the US Coast Guard and the state of Washington. Unless someone with deep pockets steps up soon, the ship is most likely destined for the breakers yard. Originally built in 1926, the Kalakala has had a colorful history and began life as the Peralta, a traditionally styled ferry operating in San Francisco, California. In 1933, a fire at Peralta’s terminal wrecked the ship’s superstructure and, instead of rebuilding the vessel in its prior form, the ship was graced with a sleek art deco superstructure to become the world’s first art deco ship. Kalakala entered service in 1935, but a design defect obstructed the view of the bow from the bridge and the ship was plagued with poor handling in the tight confines of ferry terminals. 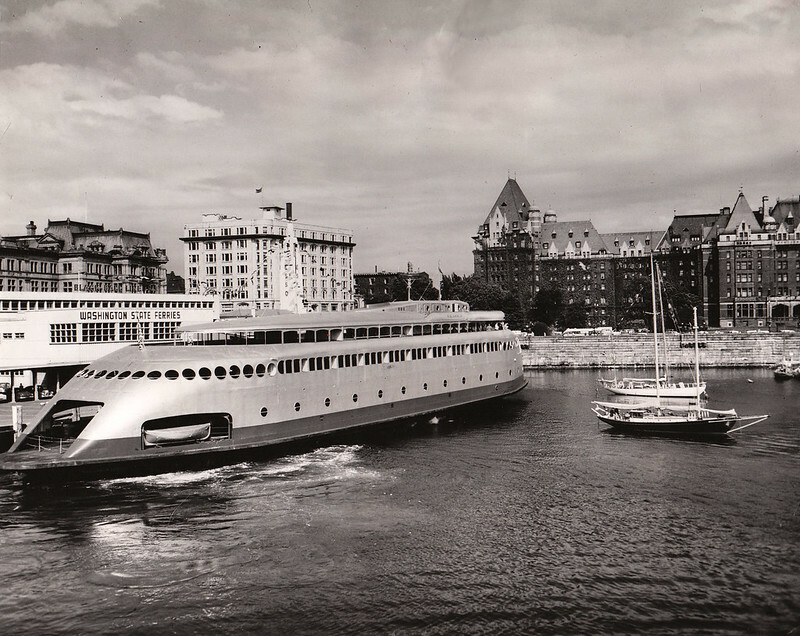 Kalakala continued ferrying passengers around Washington and British Columbia until 1967. The vessel then sailed to Alaska where she was purposely run aground and converted into a shrimp processing plant on dry land. In 1982, the Kalakala’s owners declared bankruptcy. Thus began a 30 year dance of legal maneuvering and fundraising during which the vessel was moved back to Washington and efforts launched to restore the ship.